Camping Château Lez-Eaux är en camping i Saint-Pair-sur-Mer, Manche, belägen vid en sjö/en rekreationsplats. Campingen har platser med stängsel och platser med lite skugga. Det finns möjlighet att hyra husbilar och bungalows. På campingen finns en lekplats och ett sportområde. Denna inspektör gör varje år ett besök på Camping Château Lez-Eaux och inspekterar campingen för ca 200 faciliteter och för andra förekommande punkter. Inspektören är en medarbetare från ACSI och arbetar inte för campingen. Stunning setting just a shame they would not take a phone booking with ACSI card as very expensive . Well laid out site with the friendliest, most efficient staff that we have had the pleasure to meet. The site is on the grounds of a Chateau and the outbuildings have been utilised as a shop, take away, tv room and bar. Everywhere is superbly cared for and the staff make you feel that you are a valued visitor. Toilet and shower facilities are kept clean and tidy (whilst there a thoughtless camper walked through in wet, grassy shoes - so annoying, when a site is this well cared for please have the courtesy to wipe your feet before entering!!) My husband made use of the lovely fishing lake and caught a carp so the fish are there if you have the patience. Thoroughly recommend this site and will happily visit again if in the area. This site is easy to access direct from the main road with no narrow lanes to negotiate, at the same time it is very quiet and peaceful. The pitches are easy to access and you are escorted to the pitch, so there is no chance of you getting lost looking for your allocated pitch. Toilet blocks are very clean and spacious. very well maintained and cleaned at regular intervals. There were however no hairdryers in the block near our pitch which surprised me as it is a 5 star site. There are cycle paths which leave the campsite at the back of the castle, these lead direct onto quiet roads. The coastal villages are very pretty and within easy access of the site. Vill du boka campingen Camping Château Lez-Eaux eller få mera information? Det går bra med nedanstående uppgifter eller via campingens webbsida. 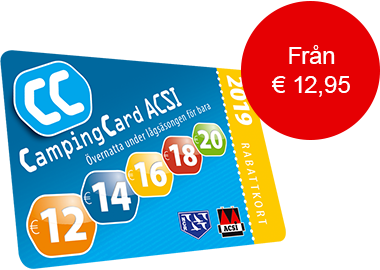 ACSI Eurocampings skickar din informationsförfrågan till "Camping Château Lez-Eaux".